“Ato Contra as Demissões e em Defesa do Emprego na GM ocupa a Via Dutra com cerca de 2 mil pessoas” Bericht am 14. August 2015 bei der CSP Conlutas über die Autobahnbesetzung worin vor allem auf die Hauptslogans Wert gelegt wird, die dabei immer wieder gerufen worden seien – dass der Streik andauern wird, bis die Entlassungen zurückgenommen worden sind. 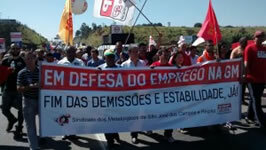 “We express solidarity with the strike of the metalworkers of General Motors in São José dos Campos which started this Monday, August 10th, against the layoff announced by the company last Saturday, August 8th. On the eve of Father’s Day, GM laid off, cowardly, via wire, hundreds of workers.